Teaching your dog to wave is a fun dog trick that will entertain and impress everyone. It's actually not all that difficult to train a dog to lift its paw and wave hello or goodbye, either. All you need is your dog and some yummy dog treats. If you are using clicker training, you should also have your clicker handy. Before you start training a dog to wave, it should first know how to shake paws. Waving is built from what the dog already knows how to do when it shakes your hand. If your dog has not learned to shake yet, it is best to go back and work on this skill. Then, when you are ready, you can begin to teach the wave. Give your dog the command "shake." When it lifts its paw to shake your hand, move your hand up slightly so it has to move the paw up a bit to get to your hand. When your dog moves the paw up farther than it would move it to shake, click your clicker or tell it "good," or "yes" and give the dog a treat. Repeat this action a few times. Each time move your hand up a little higher until your dog is raising the paw above its head. Once your dog has been putting its paw up several times in a row, give the command "shake." As soon as your dog starts reaching the paw out to you, give the command "wave" (or you can use the command "say hello" or "wave bye") and again follow steps two through four. Repeat this several times until your dog is consistently raising its paw. After a number of repetitions, stop using the shake command and only give the command "wave." 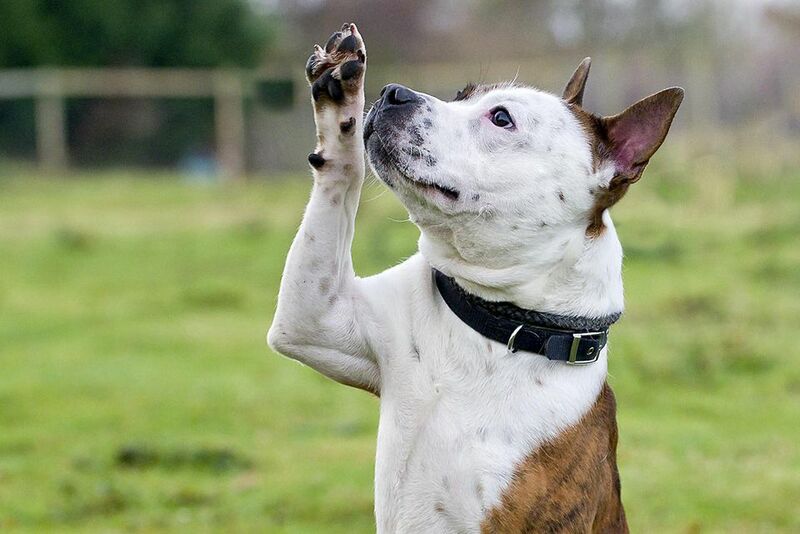 Most dogs quickly learn to raise their paw over their head on command. Once your dog is doing it consistently on command, you can be more selective and look for the best waves. Begin to only give treats when the paw is over the head and moving up and down a bit in a waving motion. If you are using a clicker to train your dog, you may be able to teach them to wave by capturing the behavior. Many dogs use their paws to get your attention, so you can capture this behavior with your clicker, and use it to teach your dog to wave. Keep your clicker and some treats handy, and the next time your dog paws at you, click your clicker and give it a treat. Repeat this several times, each time your dog raises its paw to get your attention. A dog who is used to clicker training will soon begin offering behaviors to try to get a treat. Continue clicking and giving treats each time the paw raises. Next, add the command "wave." Say the command and wait. Each time your dog raises its paw, click and treat. Your dog will soon be offering the behavior more quickly after you give the command. Keep training sessions short and upbeat. Practice the wave command for a few minutes at a time, two or three times each day. Be patient and remember that all dogs learn a little differently. If your dog seems bored or frustrated, wrap up the session and try again later. Always try to end on a positive note, such as reviewing an easy command like sit or down. Dogs are easily distracted so if you want yours to pull this trick off in front of people, it's a good idea to proof the behavior. Once your dog learns it in the house, go out to the yard where there will be a few more distractions. Then, you can do the same thing in a park or other public place. You can also practice with someone else in your house in the room and whenever a visitor comes through the door. After a little work, your dog will quickly be impressing all your friends as it greets them with a wave hello!